I think we're looking north from Argyle, but I'm not entirely certain. The West Argyle Street Historic District (also known as New Chinatown, Little Saigon, or Little Vietnam) is a historic district in the Uptown community area of Chicago, Illinois. It was listed on the National Register of Historic Places on June 3, 2010. The district covers an area of about 41 acres (0.17 km2); its rough boundaries are Broadway to the west, Winona Street to the north, Sheridan Road to the east, and Ainslie Street to the south. The area covered by the historic district originally developed in the 1880s as a suburb called Argyle Park. The suburb had been named by Chicago Alderman and developer James A. Campbell for his ancestors the Dukes of Argyll in Scotland. Development was centered around a station on the new Chicago & Evanston line of the Chicago, Milwaukee, and St. Paul Railway that opened in May 1885. The village, along with the rest of the Lake View Township, was annexed into Chicago in 1889. 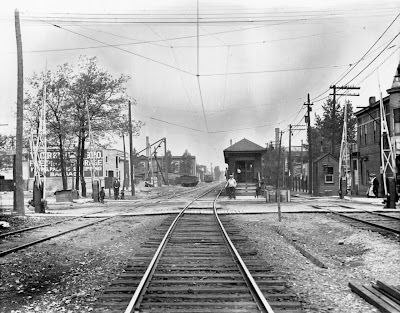 In 1908 the Northwestern Elevated Railroad was extended north from Wilson Avenue, using the tracks of the Chicago, Milwaukee, & St. Paul Railroad. This linked the suburb into Chicago's 'L' network, and the area became popular with people of limited means who wanted to live on the Lake Michigan shore. The railroad tracks were elevated onto an embankment between 1914 and 1922.